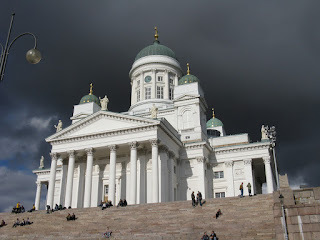 I have added a new Travels page to my blog. Living in Stockholm is pretty amazing, but while we're here, my husband and I are excited to explore other parts of Europe, too. 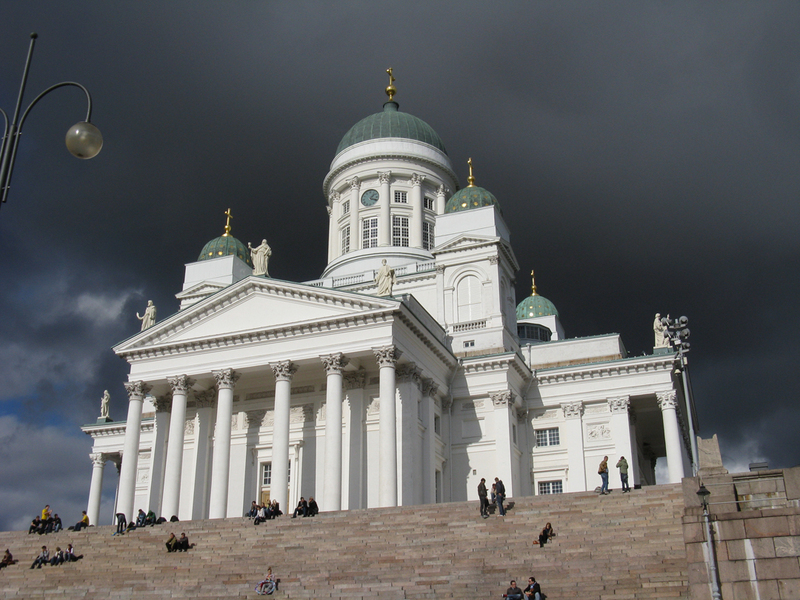 This weekend, we took a little jaunt over to Helsinki--even easier and quicker than taking a weekend trip to Dallas from San Antonio! 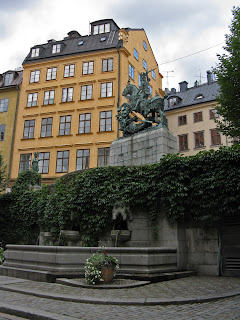 Only in Gamla Stan can you sense Stockholm’s original medieval character. A magical island of narrow lanes and crowded buildings, Gamla Stan developed after the founding of Stockholm in 1250. Two defensive towers were built on the highest part of the island; the larger tower became the core of the Tre Kroner (Three Crowns) castle after centuries of expansion (map 1). Just south of the castle is Storkyrkan (Large Church, map 2), then the Town Hall (3), then Stortorget (Large Square), a large market and gathering place (4). Because this arrangement of castle then church then town hall then market square was common in contemporary Hanseatic towns, we can assume that the locations of these buildings were planned. The rest of the original town, however, appears to have grown up organically over time. 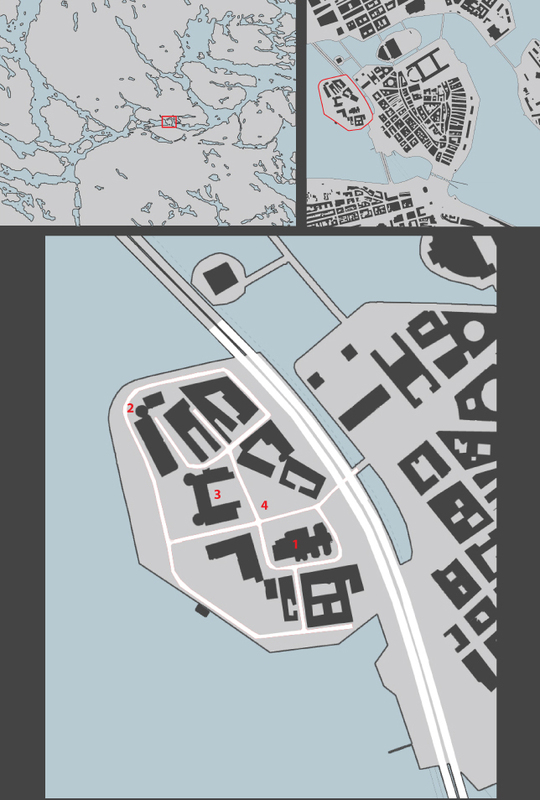 The placement of castle/church/town hall/market square on the high ground in conjunction with the boat access to the nearest islands formed a major north-south axis through the town. Streets flowed parallel to this axis so that buildings could front the city’s most prominent buildings. Even today, the north-south streets are comparatively wide and level and are more commercial at ground level with shops, cafés, and galleries. The east-west streets are narrower and cross the island’s contours; the buildings along the east-west streets are mostly purely residential. In such a crowded town, the residential buildings are more private in character and they barely acknowledge the street. I’m sure it is not coincidence that the cobblestones on these steep east-west streets are placed so that the top of each cobble angles outward, giving more grip during the icy winters. 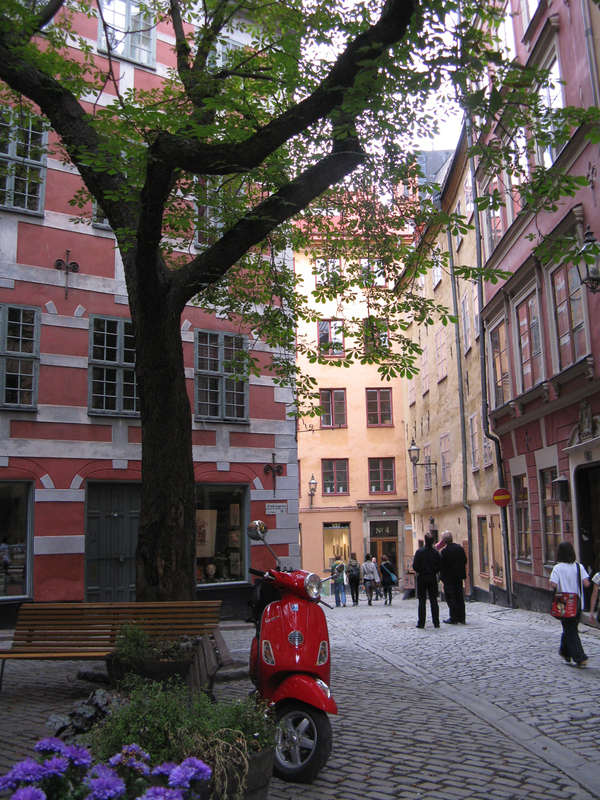 While most of Gamla Stan is pleasantly cramped, the streets occasionally open up into small squares. It seems that originally, the public water pumps were the social and functional focal point of these squares, but today, they provide vegetated relief from the dense urbanity. In addition to the original towers, a defensive wall was built around the town in the 13th century. (The location of this 13th century wall is marked in red on the map above.) 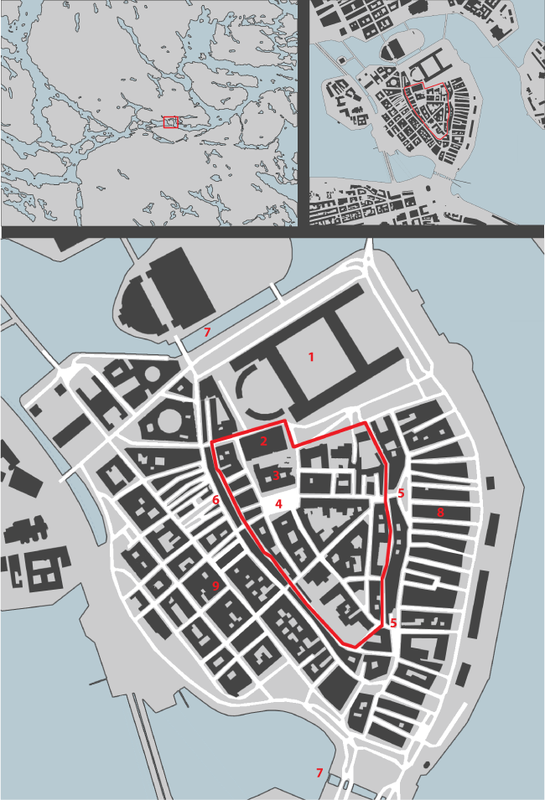 Stockholm’s perpetual housing shortage seems to have begun in the 14th century: inside the walls, the town became too crowded, and people built new houses outside the walls and on fields, also eventually infilling the marshy shoreline to provide more land to build upon. As the town grew, parts of the defensive wall were destroyed and other parts were incorporated into new buildings. The original wall is now only visible where the topography was too steep to build upon (5). On the west side of the island, building activity directly on top of the wall resulted in an extremely narrow block of buildings (6). In the 14th century, approximately 100 years after the original town wall was constructed, a new defensive wall with new towers was built to encompass the entire island. Especially fortified towers were built at the north and south ends of the island to protect and control the narrow waterways that connect the freshwater inland Lake Mälaren to the saltwater Baltic Sea (7). Although frequently under siege, Stockholm was never taken by storm due to its island location and its defensive walls and towers. Nothing remains of the 14th century wall other than some foundation segments. The easternmost blocks (8) were built during the 14th century and consist of frequent narrow lanes leading downhill from the center of the island toward the waterfront. While basically parallel, these blocks still retain the organic character of medieval Stockholm. In contrast, the western blocks (9) were rebuilt in a planned grid pattern after fire destroyed this part of town in 1625. As in all medieval towns, fire frequently wreaked havoc on the city and none of Gamla Stan’s original wooden houses survive. In 1350, Stockholm’s first Town Law was implemented to try to force citizens to build with fire-retardant materials such as brick and stone in lieu of the more common wood and peat. Two building inspectors were even appointed to try to enforce these laws! Subsequent building laws were more effective in enforcing building material restrictions, but the 1350 Town Law was effective in its efforts to control the town’s development—due to this law, most streets built after 1350 are at least five meters wide. 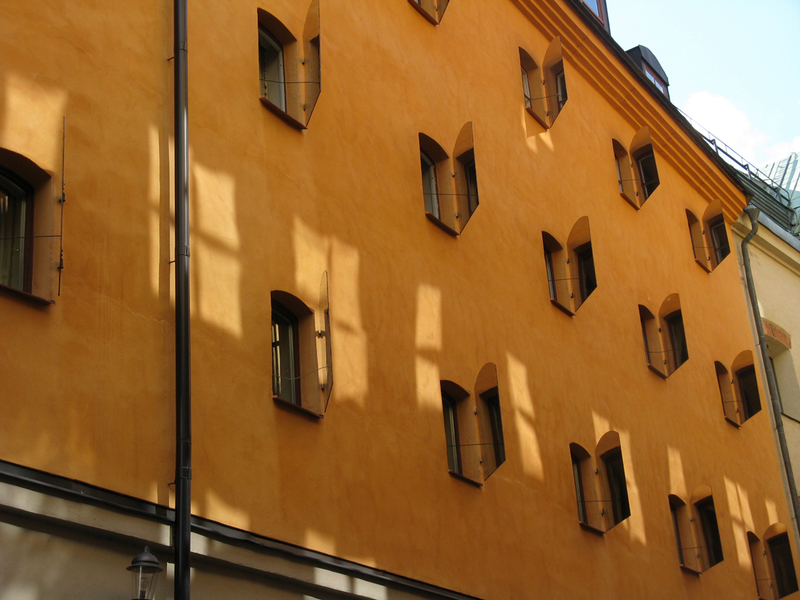 While the original wooden houses no longer exist, all of Gamla Stan’s buildings are composed of pieces that were built and reconfigured over the centuries. Walking around the island, you can see runestone fragments from before the city was founded, brick vaulted cellars from the 1300s, iron wall ties from the 1400’s, and door lintels from the 1600’s. Plaster ranging in colors from ochre and amber and daffodil, to lime and lavender and gray, to peach and rose and saffron now cover most of the buildings, but underneath the layers and layers of plaster, the brick walls are hundreds of years old. Many of the plastered facades are relatively plain, but other buildings bare witness to passing architectural styles--some facades have Baroque Dutch stepped gables, others are inspired by the Renaissance, others have a neoclassical columned facade, and still others feature cast iron pilasters and large shop windows. Later buildings tended to be a mish-mash of the above styles, their facades covered in applied decorative elements. 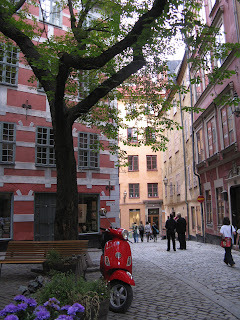 There is something magical about walking around Gamla Stan. Each new block yields a slightly different character, and the narrow, maze-like lanes make you feel like you’re on a treasure hunt to discover the next little gem of a building. 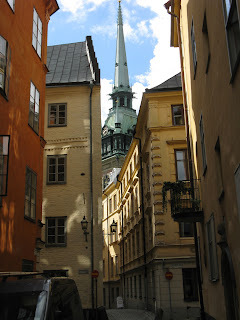 Click here if you’d like to peruse more photos from my wanderings around Gamla Stan.